Today I am happy to be a part of the blog tour for Acting on Impulse by Thea Dawson! Check it out and be sure to grab your copy! She's camera shy. He's a big star. Is love worth the limelight? Thirteen years ago, Chris McPherson drunkenly declared his love for Joy Albright... right in front of her husband. Though her angry rejection still stings, Chris, now a successful Hollywood actor, has never forgotten his feelings for her. When he returns to Silverweed Falls to direct a summer Shakespeare play, he is thrilled--and a little nervous--to learn that Joy will be managing the play. Joy Albright's marriage imploded in a public scandal a year ago when her husband was caught by the press with another woman. All she wants now is to avoid the limelight, but she can't refuse the request of a dying friend to help save the local theater group. Reunited, sparks fly. Joy is desperate to avoid more gossip. Chris comes trailed by the tabloids. But neither of them can deny the temptation to act on their impulses. Acting on Impulse is a bit of an unlikely second chance romance. I say unlikely because this romance was a romance that never really began to begin with but is all about returning home and taking that second chance on the first chance that never had an opportunity to start. This is the first book I have read from Thea Dawson and I can say that I wasn't disappointed. Acting on Impulse is a sweet romance and just the kind of book you might need to have while cozying up with your favorite beverage on a warm night. The angst is minimal, the sweet factor on point, and the swoon worthiness just the right side of steamy for this gentle romance read. There's a bit of a 'Hallmark' special feel to it that we all need every now and again especially when we've had a hard day. I loved that this isn't a typical romance, Thea's characters come to you full of history, prior relationships, children, stressful jobs, mortgages...baggage, but the everyday you and I kind of baggage (well except counting that our hero is a bit of a bad boy Hollywood star. His name is Chris and you might find a connection between his rise to stardom and another famous Chris that I kind of sort of have a super huge crush on so you know I was all about out hero. I loved that Chris, our hero, really grows up in this story. We meet him when he is quite young, just starting out his college career and shall we say, not particularly in control of his emotions, and finds him self falling head over heels in lust/love with his community theater co-star, who happens to be married and has a young child. At first I thought I was really going to be put out by this guy who clearly didn't care about the life status of his crush, but...well, as you will see in the book, he definitely matures, discovers who he is, and along the way makes amends for his past while creating the future he always wanted. My favorite thing about our heroine was her drive. She found herself in a really bad place in life and instead of letting it take her down a bitter road she held her head high and 'soldiered' on. I liked that even though she wanted to stick it to the man who hurt her and in some ways does it just a little, she never lets the ugliness take her too far and she recognizes that she has to let go of her past so she can have a happy future for herself and her daughter. I am one of those readers that always loves when karma catches up to the antagonist in a story, but I have to say I was so proud of this heroine for taking that high road and I don't feel totally disappointed that a little comeuppance didn't come the way of the 'other person'. Acting on Impulse is the second book in the Silverweed Falls series but I can honestly tell you that you won't be missing anything if you haven't read the first. I truly didn't even know that it was a second until I went looking to see who's book would be coming next. 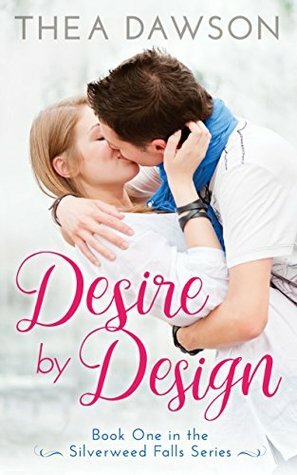 I think that if you read the first one Desire by Design before moving on to Acting on Impulse there might be some small nuances that you will pick up on but if you haven't trust me when I say it won't change anything about how you read this book, it is a true standalone with in a series. After meeting on the characters in Acting on Impulse I think Thea Dawson has quite a series line-up ahead for us. I can pick out at least 5 characters that I would love stories on so here is hoping! Celia Jackson, widowed mother of three, is re-designing her life. Literally. With only her talent for art to fall back on, Celia is determined to recreate herself as a graphic designer. To make ends meet while she takes design classes, she accepts a job as nanny to the daughter of Richard Hawkes, professor of engineering at the local university. Richard is infuriating, arrogant and tactless by turns—yet Celia finds herself undeniably attracted to him. Richard Hawkes, recently tenured and more recently divorced, lives only for his work and for his young daughter. His ex-wife made his life a nightmare before leaving him for another man, and he has sworn off romance forever—until his spunky, down-to-earth nanny paints a picture of a different kind of love. But Celia won’t wait forever. Richard will have to put aside his pride and come to terms with his past if he wants to build a better future. Thea Dawson has lived in Rome, Tokyo and London, and spent much of her twenties traveling around the world. Eventually she met the love of her life and settled down in the Pacific Northwest, where she now lives with her husband and three children. After a checkered career which included stints as an English teacher, librarian and editor, she now writes full time, telling tales of romance and adventure. This story sounds fun and I just adore the cover! It was a sweet romance! I hope you will pick it up and enjoy it!